Hey Glogirly! 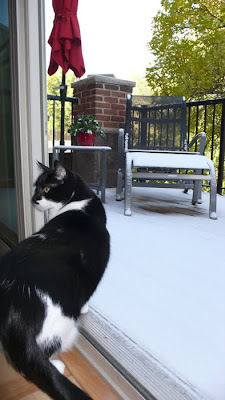 Look at this white stuff on the balcony. What the... Would you look at what I woke up to this morning. I remember there being a bunch of this white stuff outside earlier this year. Every time there's a bunch of it Glogirly has to bundle up with lots of coats when she goes outside. The bundling is usually preceded by a few expletives. Then when she returns, more expletives. This poor cactus probably won't even make it through the day. It's wilting my the minute and I'm afraid it's a goner. Glogirly should have brought him in last night like she did the geranium. So the weatherman said this stuff is snow and it's our first of this season. It's not supposed to stay long. But there's more where it came from and this is apparently a glimpse of things to come. Glogirly opened up the door by the balcony so I could get a good whif. Stupid Red Dog was in my way at first. This snow stuff, it's very cold and windy. Kind of hurts my delicate nose hairs and feet. I'm going to have to think twice about stepping outside this door again. I feel sorry for the poor cactus. That stuff is hard on the feet, Katie. It's better to stay inside when there's snow on the ground. I've only seen snow once and that was when we were in Texas. I love to watch it fall. I don't think I would like to be out in it though. 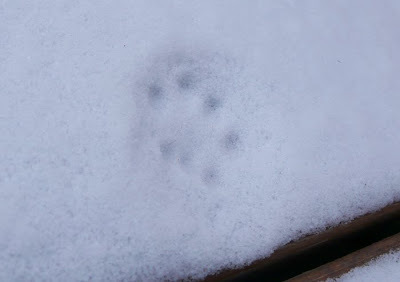 You look so cute peeking out at it and love your pawprint! Snow!! Oh wow! Snow sure is pretty, but very very cold! Thanks so much for the photo compliments. Yep, the pics are from mom's new canon sd780. She is really liking it so far. She is hoping to get a SLR soon as well! Oh goodness!! We rarely see that here, and when we do see a few flakes, Atlanta closes down. Stores close, schools close. What a mess we are in. Hope the plant does not die. Looks like a Jade to us, we used to have one and it was so pretty. Hi Katie, your glogirly stopped by our blog today and left the nicest comment so we had to come and visit you and we like your stories and your photos and your mannequins, too. We be followin' ya now! Well, Katie, just feel lucky you don't have to go out there to go to the bathroom. 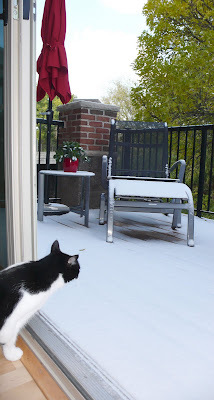 Button, sweet poodle wasn't scared, but Barnabus, bold border collie was scared of the white stuff. He had to be coaxed to go out into it. Normally, Barney loves to plow through it but not today. Keep your self warm now, and go take a nap. OMC!! Snow already??!? It's waaaaay too early for that white stuff!!! We hope it't not headed our way! It seems like we just got rid of that freezing stuff!!!! Thanks for stopping by today and leaving me your comments! It's now about 6:00pm and the snow has indeed melted. 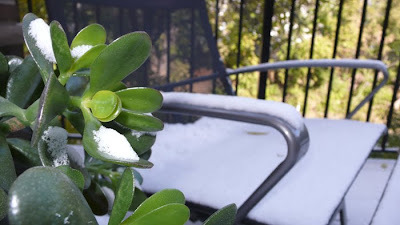 Sadly the jade cactus plant is officially, well...dead. I know many of you enjoy living in warmer parts where snow is something you buy in a plastic bag and throw on your Christmas trees. For the rest of you, I'm afraid you're probably in for some of the same cold white stuff we got here in Minnesnowta today. I'm going to go help Glogirly find her missing glove now. Just like I did last year. And the year before that. When 8" of that stuff fell here in the desert I can't tell you the number of expletives that came out of my parents. Mom and Dad had never driven in snow. Hi Katie! I saw you joined Cats with Blogs so I came over to say hello. That's me on the CWB logo. It's nice to meet you; I hope we can be friends! We are still experiencing upper 80's to 90 degrees here. WE would love a little cool stuff. 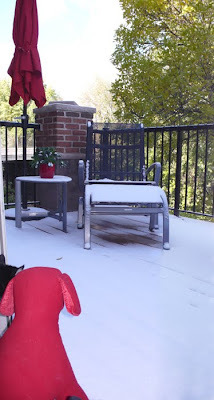 We never (well once in Momma's life time) get cold white wet stuff on the ground. I love snow, I like to snow plow with my nose down. My whimpy feline sisters, whoops I mean my wonderful feline sisters, are indoor cats, so they don't know what they're missing.